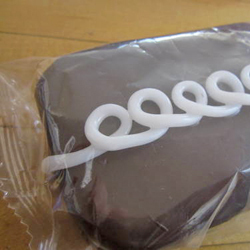 Faux Foods: All The Fun With None Of The Calories! Posted on 9/4/2012, 9:57 am, by rackycoo, under General Projects. Although the foods pictured here look tasty, they are all totally calorie free, since none of them are even edible. Whether they’re decoration, children’s toys, or bath products, these faux food projects are all in good taste. Doesn’t this plastic wrapped chocolate treat by thisbirdsabsurd make your mouth water? Better not take a bite, because it’s actually a polymer clay-covered Altoids tin! This delicious breakfast of pancakes, sausage, eggs, and bacon is fun to play with, but it won’t fill you up. 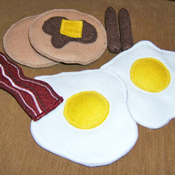 jennieingram made this meal not in the kitchen, but in the sewing room, with felt! 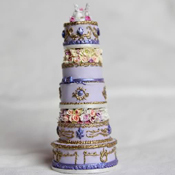 This beautiful reproduction of a French wedding cake by Rachelslittlethings is actually made of polymer clay. It’s also so amazingly detailed for its tiny size. Check out the post to see this stunning confection photographed with a quarter for scale! 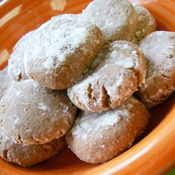 EmmyFNWL made these bathtub cookies not to eat, but to add a fizzy twist to your bath. Follow her recipe to make this yummy looking bath bomb that your skin will love. Here are some treats you won’t mind handing to your kids any time of the day. 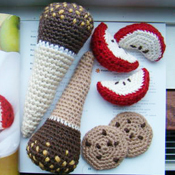 sukigirl74 crocheted cookies, apple slices, and Nutty Buddy ice cream cones. Mmmm! Craftster is full of these and other fun faux food projects. Click on the tag “faux food” to see them all! « Mr X Stitch Presents: The Cutting (& Stitching) Edge – Nike Schroeder Part 4!